You can give the gift of saving an endangered species. Donations to Friends of the Island Fox go directly to conservation efforts in the field to continue the successful recovery of island foxes. The island fox pictured on the ground is wearing a radio tracking collar. To date members of the community like you have funded 56 radio tracking collars that allow field biologists to track island fox activity and respond quickly when an individual island fox dies. Early response enables scientists to determine the cause of death: golden eagle attack, disease, car strike or something unexpected. The faster biologists can respond to a specific threat, the quicker appropriate action can be taken to protect living island foxes. 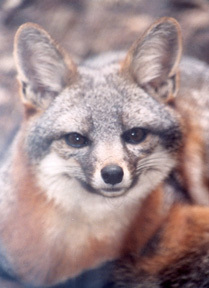 $10 vaccinates an island fox against its two greatest threats - rabies and distemper. General donations to Friends of the Island Fox support our education efforts in Santa Barbara, Ventura and Los Angeles Counties. (Island Fox Ambassador Schools, Island Fox in the Classroom, Community Fox Talk Programs) Long-term population recovery demands that local citizens understand the threats to island foxes and the important role foxes and people play in maintaining a balanced ecosystem on the islands. 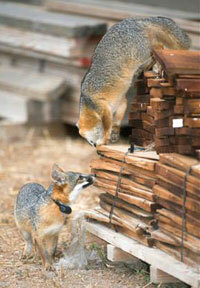 You can play an active role in the continued success of saving the island fox by donating today.